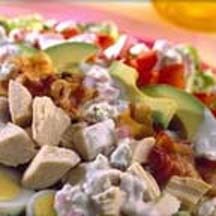 CooksRecipes has quality, kitchen-tested recipes for turkey main dish salads, including great makeover ideas for holiday turkey leftovers! Turkey, bacon, avocado, tomato and eggs arranged on greens and served with delicious homemade blue cheese dressing. 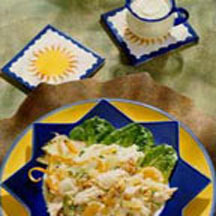 A Pacific Rim-style brown rice and turkey salad served on a bed of lettuce and drizzled with a lemon curry dressing. 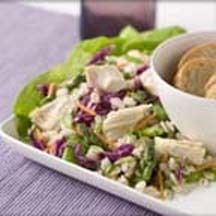 A colorful barley salad with turkey, asparagus, red cabbage and carrot tossed with and a lemon-Dijon dressing.